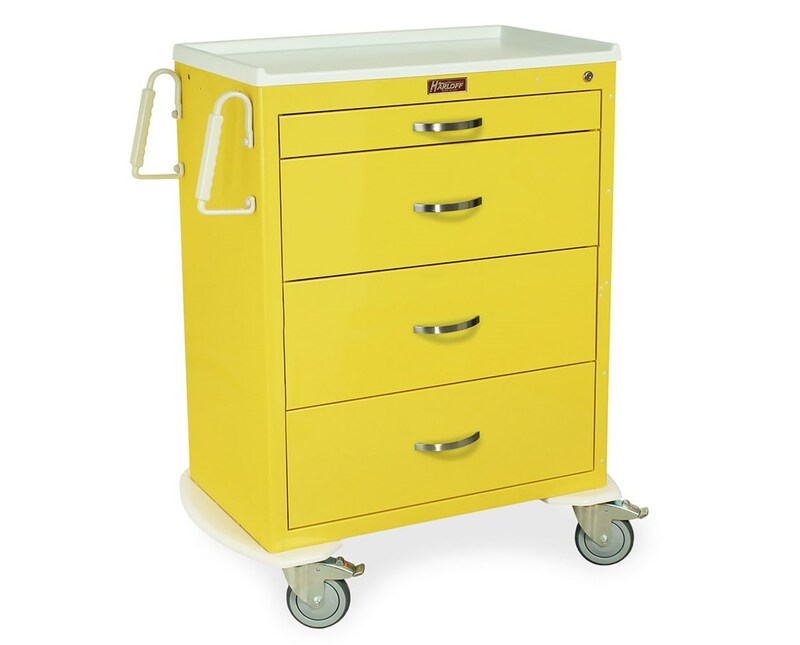 Harloff's Classic Four Drawer Infection Control Cart with Key Lock combines the traditional medical cart with the steps and storage for supplies necessary to reduce the risk of pathogen transmission in hospitals between patients, healthcare workers and visitors. Uni-body steel construction and a durable, hard baked powder coat finish along with a 12 year warranty give you a cart you can rely on for years to come. This cart's design allows for customized drawer configurations within its 30" of vertical drawer space. 1 3" drawer and 3 9" drawers give you all the space you need to store all your isolation supplies. The drawers operate on ball-bearing full extension slides. A full wrap-around bumper on a separate stabilizing frame keeps the cart safe from collisions, and 5" full swivel ball-bearing casters (1 tracking, 1 with brake) move the cart smoothly and efficiently. The aluminum side rail/push handle (Standard Package) gives you total control over the cart. A key locking system keeps the cart secure. 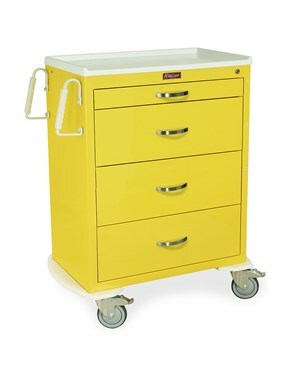 We offer Harloff's Classic Four Drawer Infection Control Cart with Key Lock with Standard or Specialty Packages, and in 12 colors (View Chart); call for information on silver ion antimicrobial paint. Select from the drop down menu above and order online direct by clicking "add to cart!" Number and Size of Drawers (1) 3", (3) 9"